I thought we had seen the last of the oak deliveries, but apparently not. This is for the handrail that goes above the parapet wall in the hall (the large 150mm x 150mm sections). The remainder is for the canopy over the front porch. There are some big pieces of oak here. 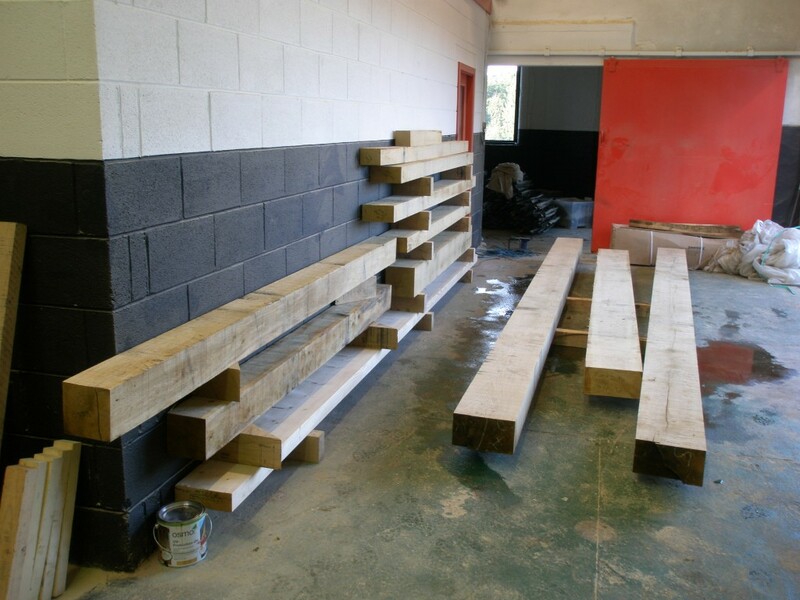 The new oak trusses will arrive on site later this week and we will probably see them go into position before the weekend (weather permitting). The steel work that bridges that gap above the bi-folding doors and the large oak window in the extension has finally been installed. The poor weather yesterday meant that there were a couple of attempts to get the welding done, but with no luck. Today, the weather improved and we got the steels welded in place. These are needed so that we can install the oak roof trusses later in the week. Many thanks to the folks at Bridge Fabrications (http://www.bridgefabrications.co.uk/) for being so flexible about getting this work done. There are two sets of bifolding doors in the extension with a large square oak window in the middle. Two large steel beams span this gap and are welded in the middle. The steel won’t be seen when finished, but the oak trusses for the new roof rest on it. 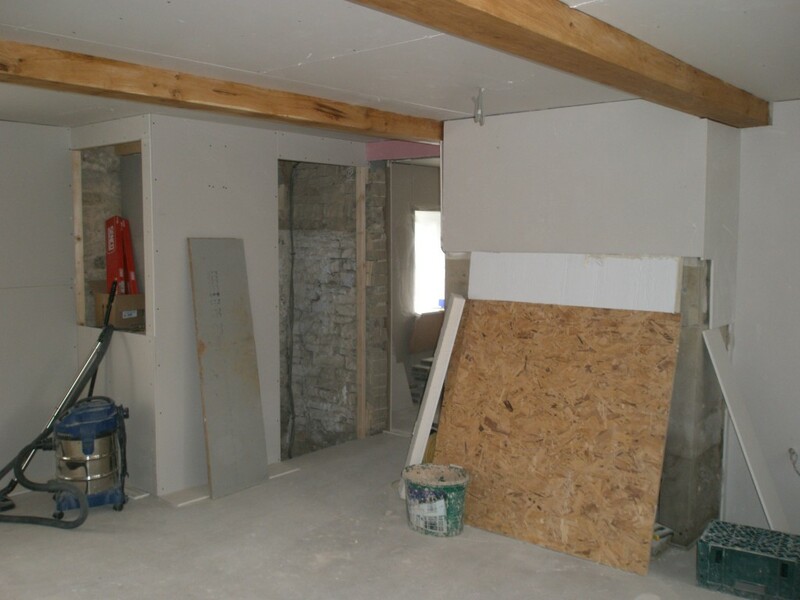 With the first fix electrics completely and the plastering well underway in the old cottages, it won’t be long before we are ready for the second fix. This means installing all of the switches, sockets and light fittings. Getting the computer configured that will run all of this will not be far behind. On the basis that I haven’t done this before, I thought it might be wise to get the kit configured on my desk before installing it in the new house. It also means that I get to familiarise myself with it. Sadly, with the poor weather recently, I have been glad that I have some thing to do indoors. That said, it is going to take some time to get this stuff configured. 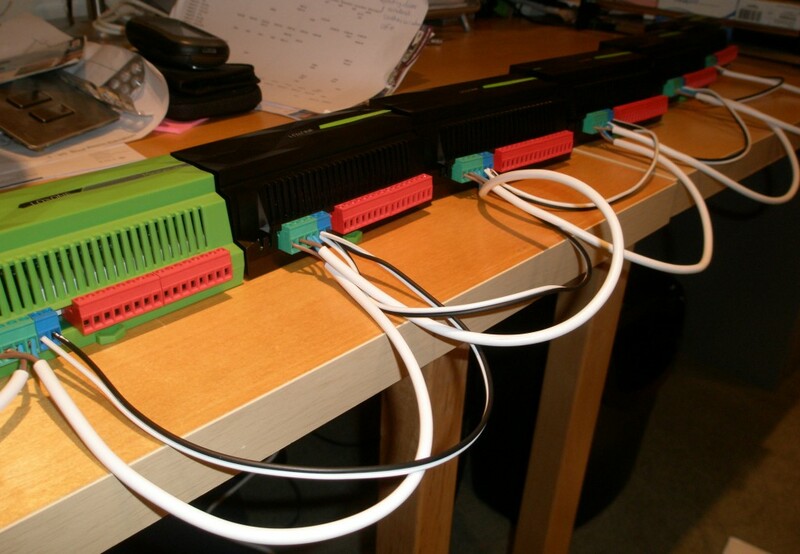 In reality, we will only get it 80-90% configured now – the rest will be done as it gets installed. I just hope that I can get my head around this and get it programmed. In the first instance, I will just be pleased if I can get it to turn the lights on and off. The fancy stuff can come later. I am on a training course next week, so hopefully I will know a bit more by the end. Here’s hoping! This is the majority of the kit that will be need to control the lighting in the new house. I have set it up temporarily so that I can get it configured before it is installed. 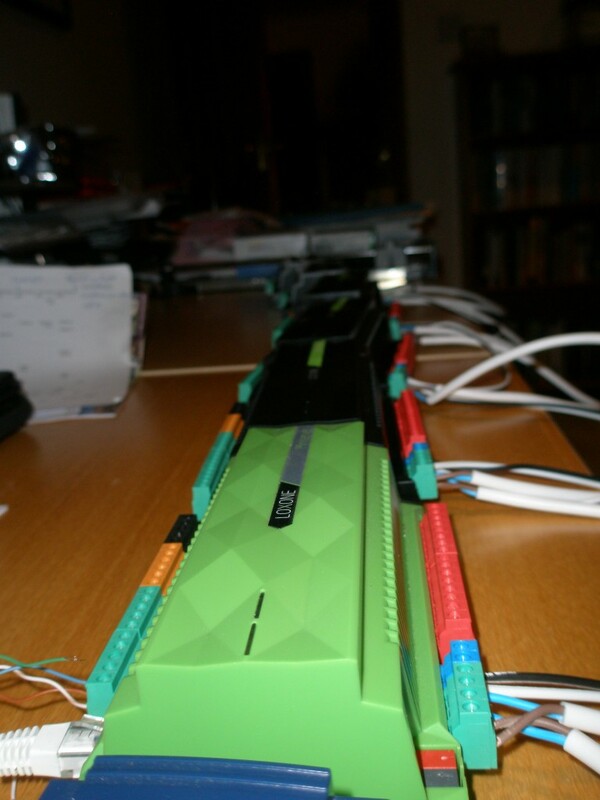 The green box is the computer, the other boxes are needed to control the switches and lights. We have been struggled with the colour scheme in the house for a while, but hopefully we have now cracked it. We have been using our “prototype window” to test out different colour combinations. We want to use the same colour scheme throughout the house, so it needs to be relatively neutral as well as working with the existing elements (the green window frames, natural stone and oak beams). Our natural starting point was the inside of the window reveals. 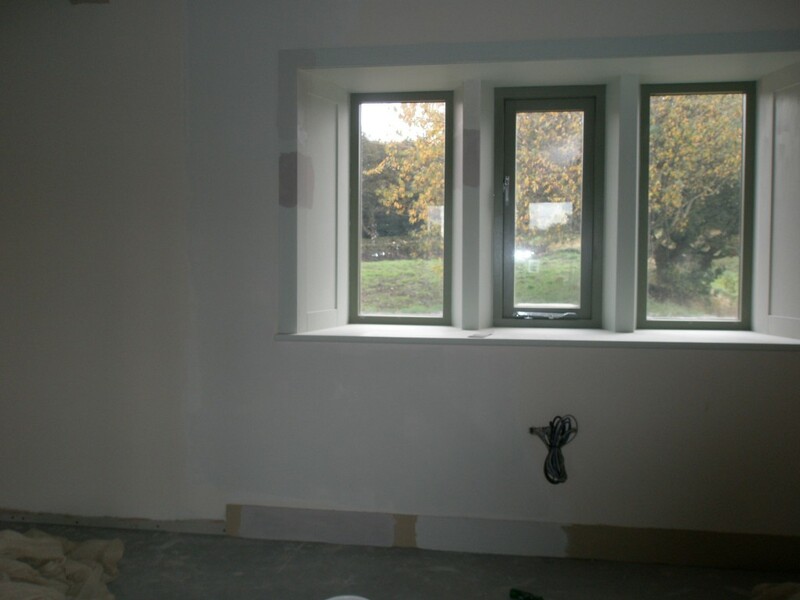 Since the window frames are already a green colour, we thought a pale green would work. It does. 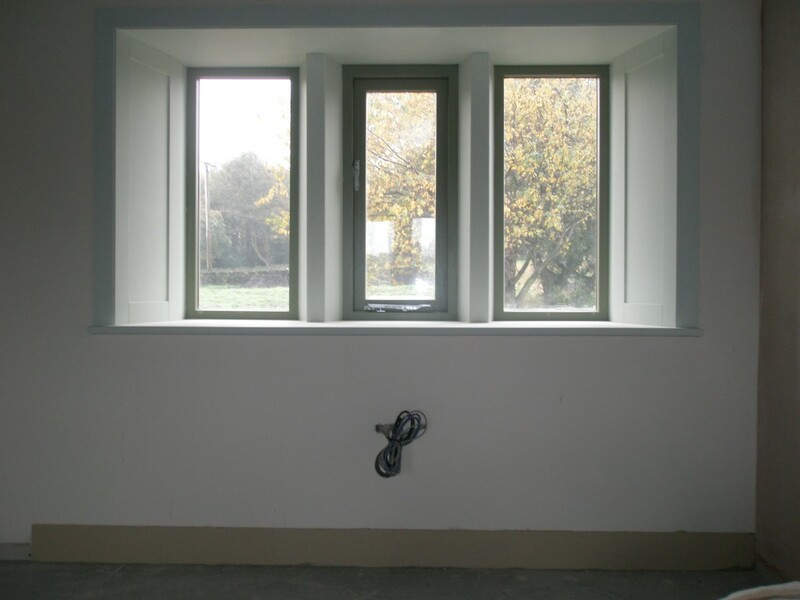 However, the large expanses of window reveals mean that there will be a lot of green in every room. The colour needs to be light as it bounces the light into the room as it comes through the window. We also thought that magnolia might be the right colour for the walls. However, the colour scheme just wasn’t subtle enough. We have ended up using jasmine white rather than magnolia. This is a lot lighter and more subtle. We have also swapped out the pale green for a light taupe colour. This produces a much subtle colour scheme. Over time, I am sure that we will change this scheme but for now it seems like a good starting point. Magnolia on the walls and light green on the inside of the windows. with the amount of window reveals, this has produce quite large expanses of green (even if it is light). Magnolia on the wall, light green on the inside of the windows and a sort of “khaki” colour on the skirting boards. Having decided that the light green on the inside of the window reveals wasn’t right. And also that khaki wasn’t the right colour for skirtings! 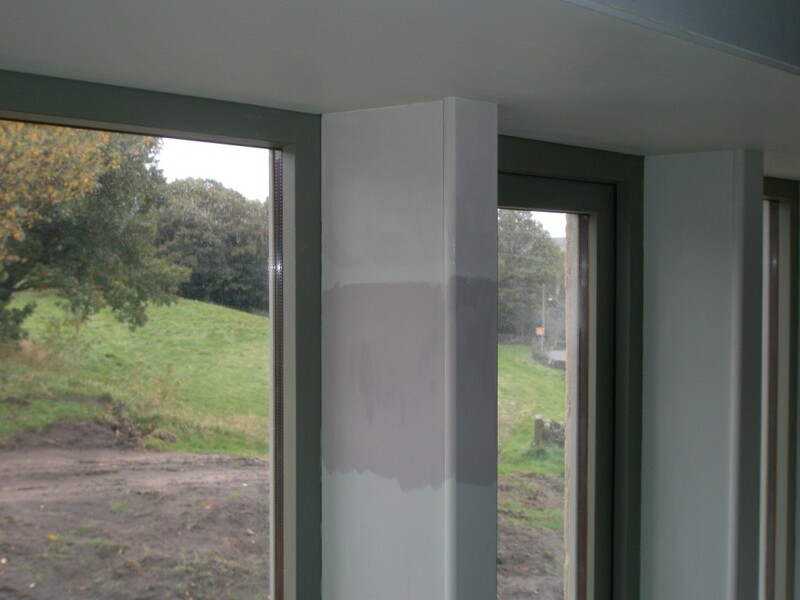 We have tried a couple of natural taupe colours – a light one and a darker one. You can see the test patches here on the skirting, the left-hand window revela and on one of the mullion covers. 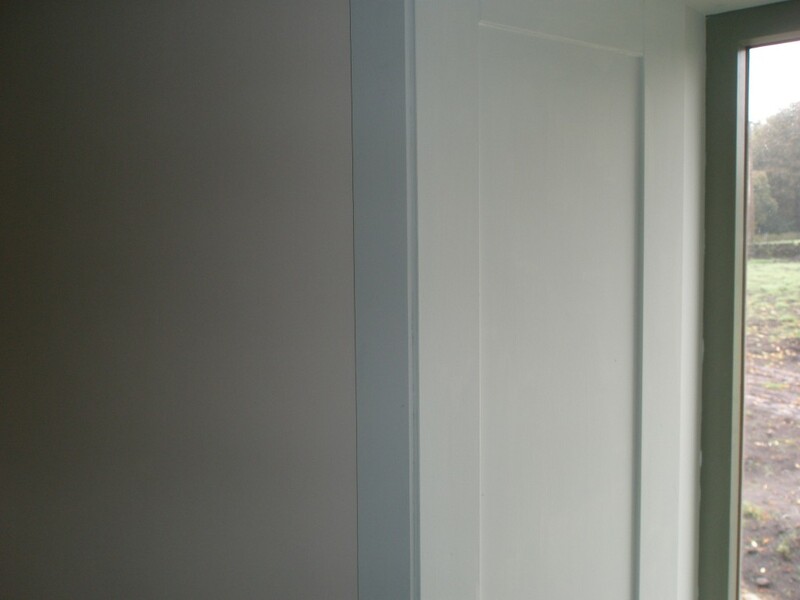 You can also see the difference between magnolia and jasmine white on the wall to camera left. Light green on the inside of the windows, plus two test patches of natural taupe 2 (the darker one) and natural taupe 3 (the lighter one). 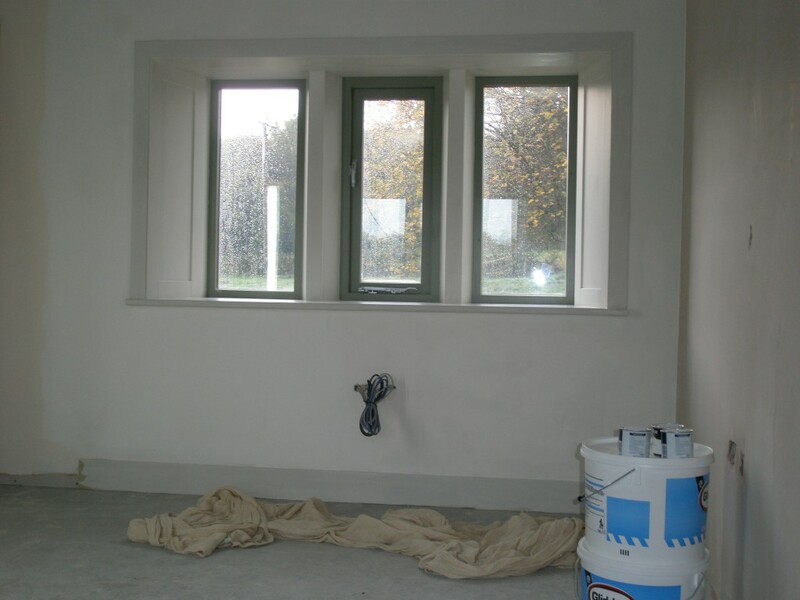 Jasmine white on the walls and natural taupe 3 on the inside of the windows and the skirting boards. The architrave and skirting boards are plain MDF for the sake of this experiment. There are a number of large openings in the extension and we are using steel to bridge these openings. When finished, you will not be able to see the steel as it be covered with stone work. Despite the bad weather, the first of the steels (the one across the top of the large custom oak window) was installed. The other steelwork is now on the ground in the right location. We will get this into position next week. All in all, this week was one of the wettest in the build so far. Let’s hope for better weather over the next 2-3 weeks as the roof goes on. 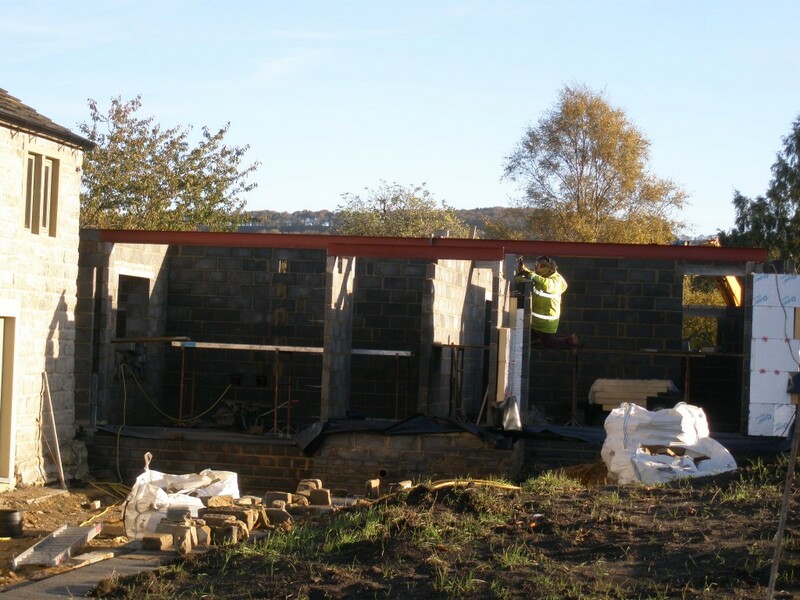 The first of the steels has been installed. Due to the poor weather, this was the only steel to go in today. It was another wash out. Even Zep decided that it was time to put a coat on! Next week we are due to start erecting the new oak trusses in the extension. These have been built in an industrial unit over the last 2-3 weeks. They will be numbered, disassembled and then re-erected on site. Given that we are approaching the end of October, we cannot rely on the weather. Indeed, the weather over the last couple of weeks has been very mixed. We have decided that it would be nice to proect the new timber from the elements while the roof is being erected. A bit of investigation seems to suggest that Osmo UV protection oil is the right choice. We have used an interior version of this to coated the existing beams, but this is the exterior version. 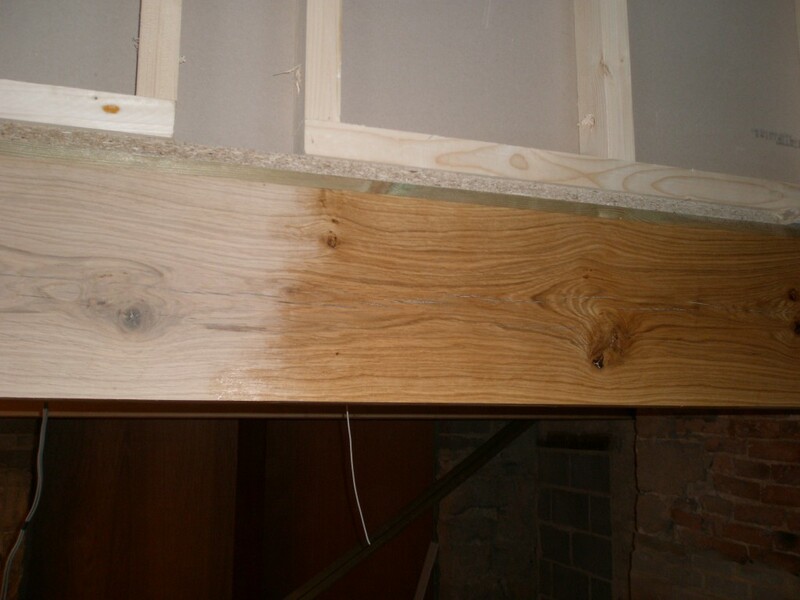 When the oak trusses were sanded and coated in this stuff, they simply looked amazing. 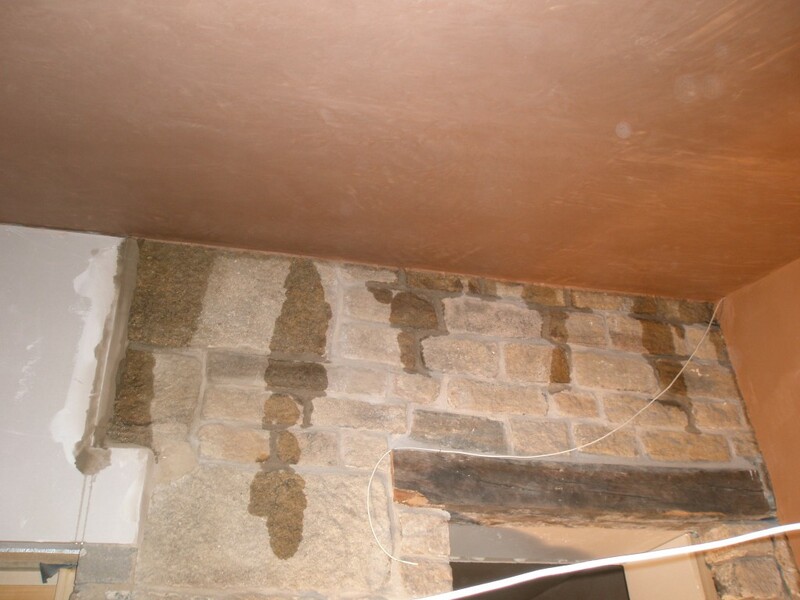 We have used oak in the existing cottages to replace the old floor beams and have decided to use the same stuff to protect them. As the plasterers are due to plaster some of the downstairs rooms tomorrow, we thought it might be a good idea to put something on the untreated oak. The Osmo product works a treat and the oak looks amazing. Plus if anything gets accidentally spilt on the oak, it should simply wipe off. We have decided to paint the new green oak beams in the cottage. This should help provide some protection from the plasterers! The unpainted section is on the left, the painted section the right. It has really brought the grain out of the wood. Despite the poor weather forecast for today, we got some good weather this afternoon (dry, at least). This enabled us to get on with the building of the internal kitchen wall. 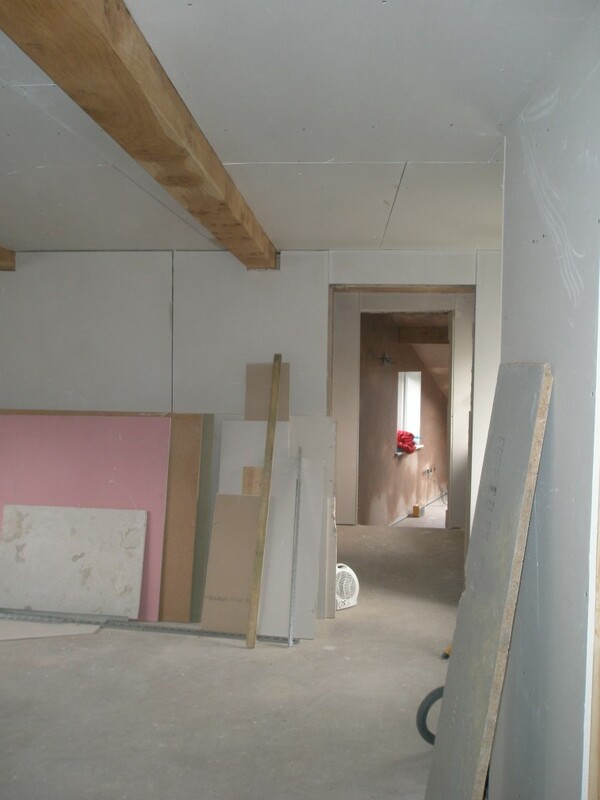 The reason that this is important is that the roof truss sits on this internal wall. 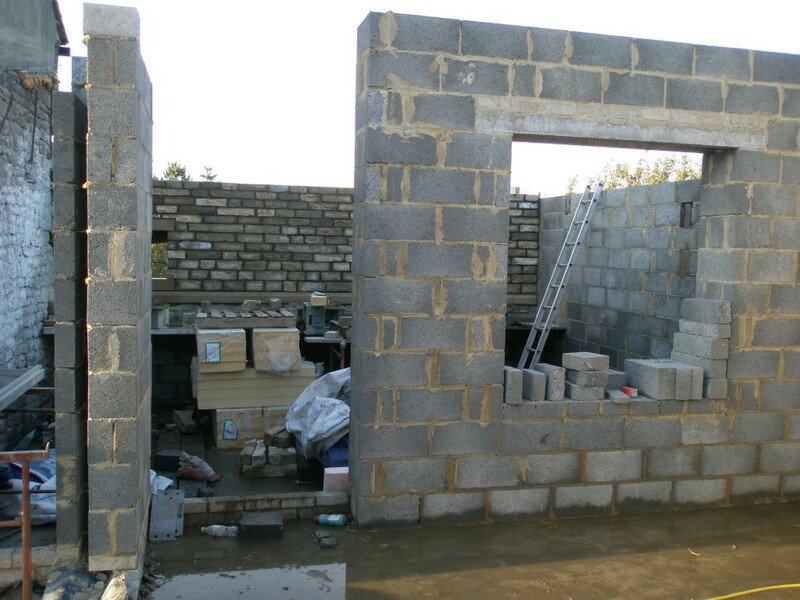 This means that we can’t start erecting the roof until this internal wall is in place. The roof sits on the inner wall of the building and not the outer. 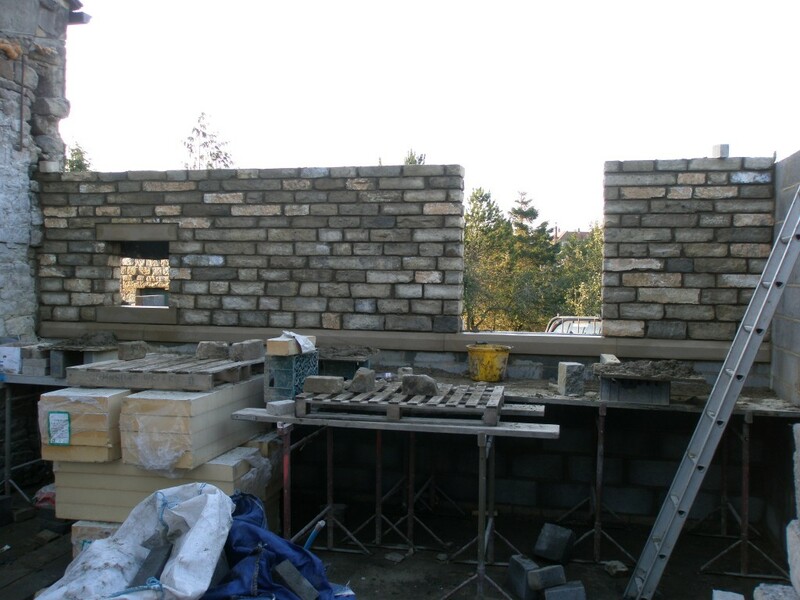 This wall is made up of reclaimed stone from a couple of internal walls that we demolished previously. Once finished, we will sandblast this wall to remove all of the old paint and grime. 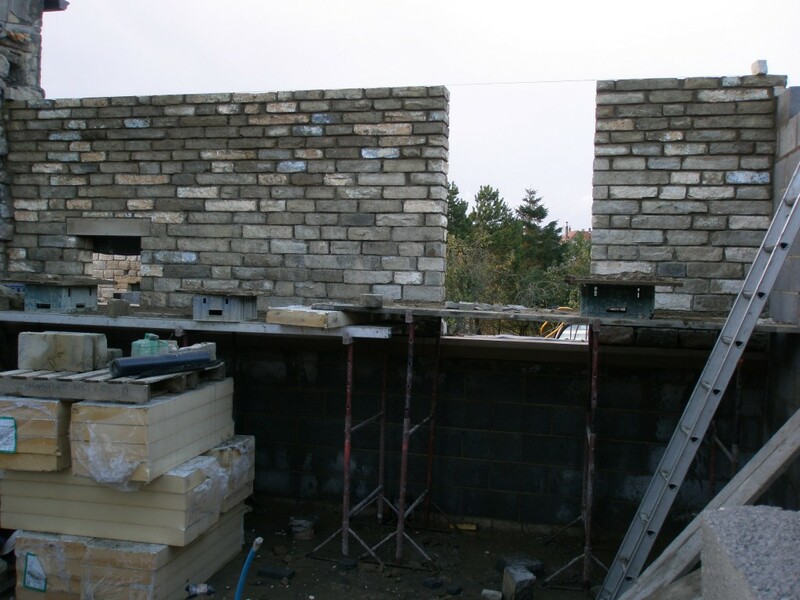 The internal wall, like the outer walls, will then be pointed. 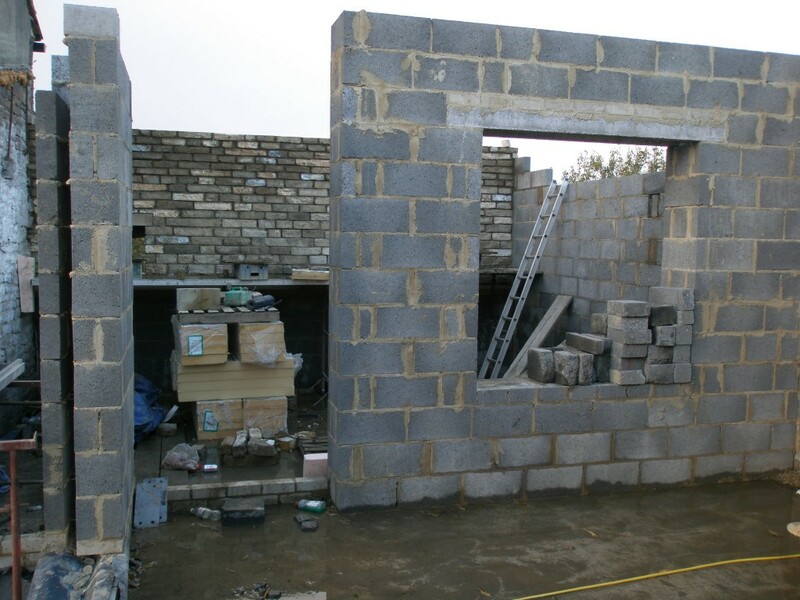 Today we reached the height of the second window in the kitchen. This is a big one. Much bigger than we thought. Tomorrow the window head will be installed and the last few inner course built (weather permitting). Despite the poor weather forecast, we had some decent weather today – particularly this afternoon. This enabled us to get a few more courses on the internal kitchen wall. The view from the front of the building. You can see the back of the new internal kitchen wall. Yes, that is a window on the right – not a door! I don’t think that we had realised that it was going to be this big! But at least it will let lots of light in! 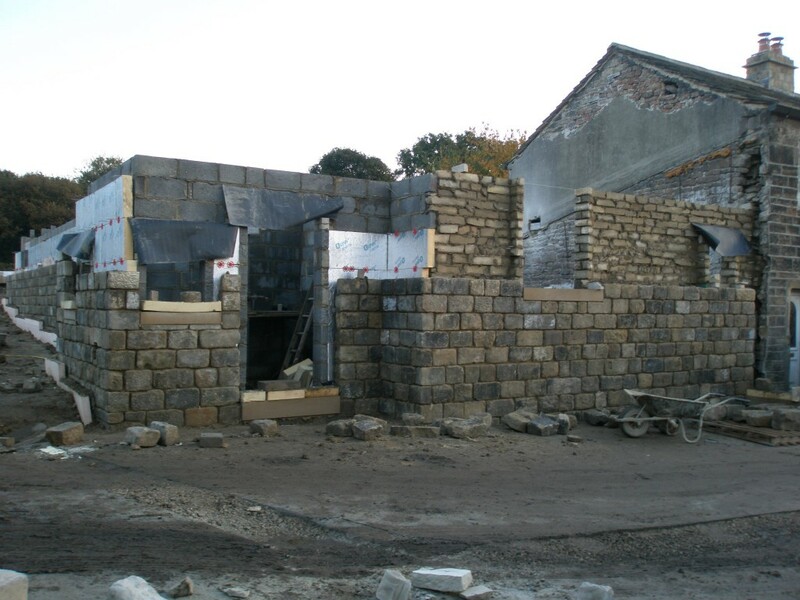 We had a fine day today so pushed ahead with the stone work on the internal kitchen wall. 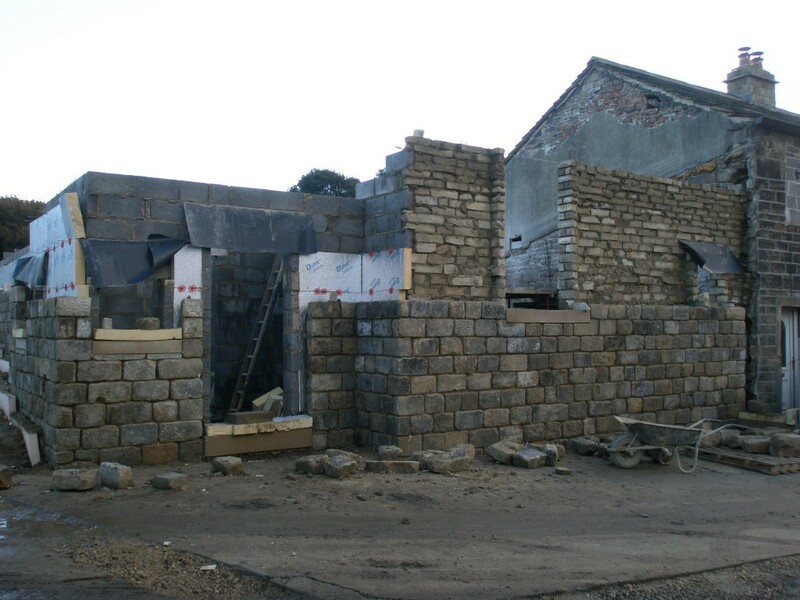 It is forecast for wet weather again tomorrow, so we might not be able to finish the rest of the kitchen wall off until Saturday (which is the next dry day). We decided to use reclaimed stone (from a couple of walls that we demolished onsite) to build the front kitchen wall. 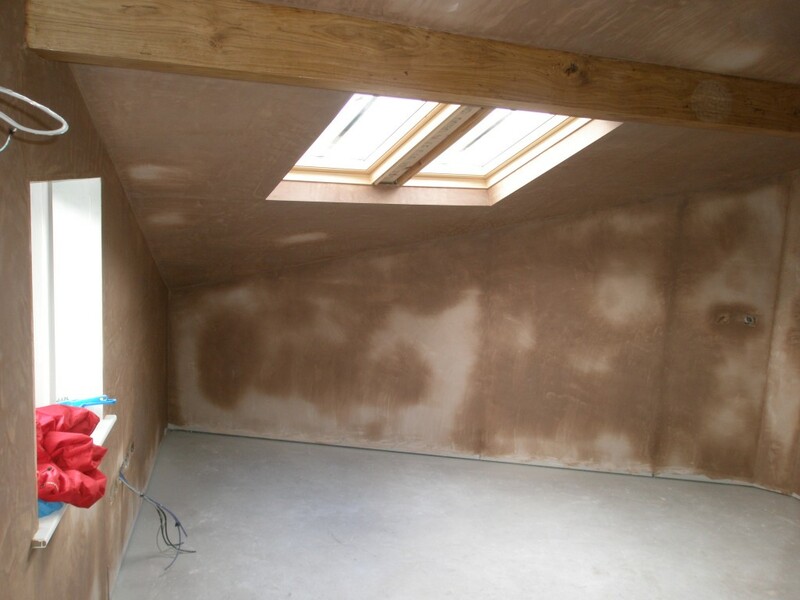 This will provide a kind of feature wall and help avoid a large expanse of painted plaster! Once the wall is up, we will sand blast the stone to remove any debris and paint. The wall will then be pointed. All of this needs to happen before the roof or the windows go in. This will probably happen in the next 2-3 weeks. The internal and external kitchen walls. Both made out of reclaimed stone. The internal kitchen wall has been built (or at least part of it) today. 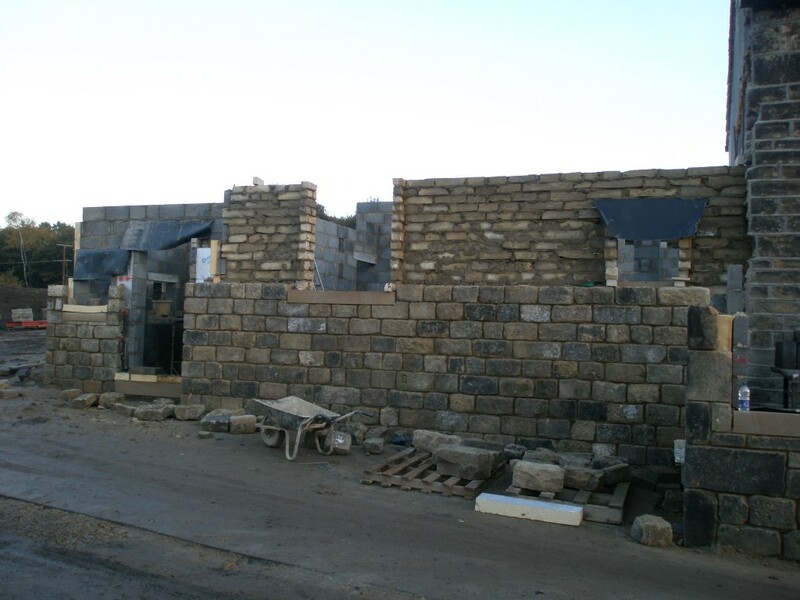 We are using some of the stone that we reclaimed when demolishing some internal walls in the existing cottages. 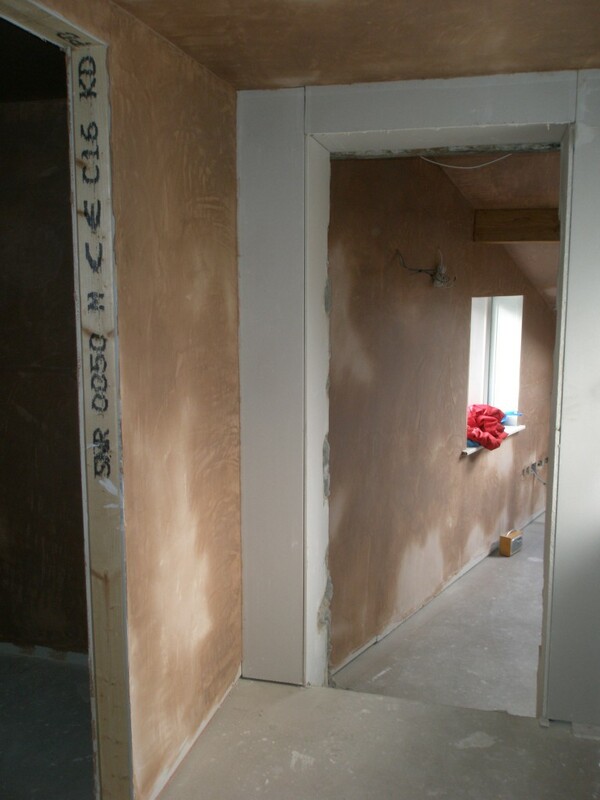 This the door into the bottom room and the utility room beyond. 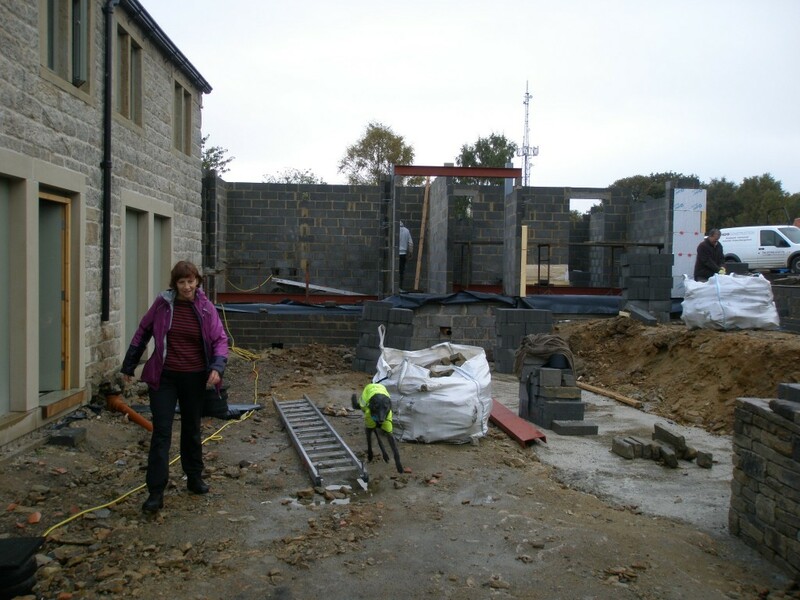 You can see the back of the internal kitchen wall going up. Looking from the lounge into the kitchen. This is the new internal kitchen wall. 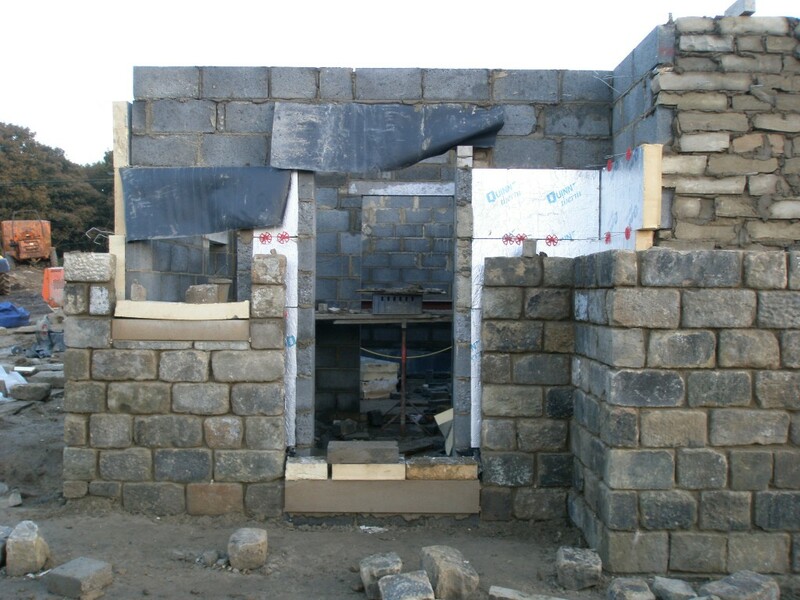 We have made the best of the dry weather today and pushed ahead with the internal kitchen wall. Rain is due again tomorrow, but there is some more fine weather forecast for Saturday.